As always, watching on traditional TV remained the most widely-adopted activity, by over 284 million Americans. However, watching time-shifted TV is now done by over 175 million Americans per week, up from 167 million a year ago. Oddly, watching video on the Internet actually dropped by a bit, from nearly 150 million Americans in Q2 '13 to over 145 million in Q2 '14 (Nielsen didn't provide an explanation). Watching video on smartphones continues to surge, with over 114 millions doing so in Q2 '14, up 18% vs. a year ago. 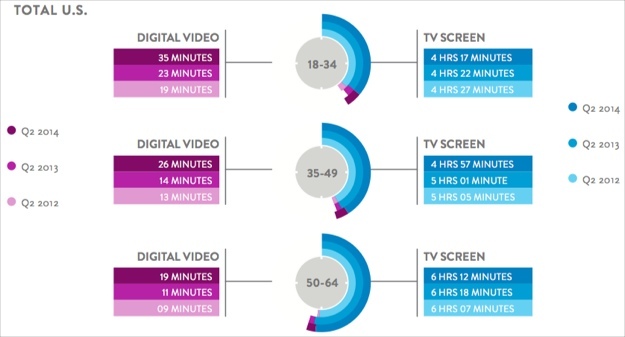 No surprise, 18-24 year-olds notch the most time watching video on smartphones, at 26 minutes/week, followed by 25-34 year-olds with 17 hours/week. These usage levels could be poised to move strongly higher with the impending release of the iPhone 6 with its larger screen sizes, better resolution and faster processes, which could contribute to more smartphone-based viewing.